The first thing I usually do when I receive a book to review is look up the author and find a little more about them and their previous books but I just dived in with this book and didn’t find out until after I had read the book that this was actually the 5th book in the series of the Sophie Green Novels, not a stand-alone book but having said that I still found I followed the storyline perfectly without having read the previous four books, although there are many references during the book to about many of Sophie’s mishaps but there is enough insight given to us about her past to understand her character and past and present situations. 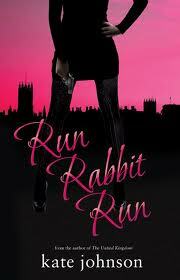 In Run Rabbit Run Sophie Green is on the run after being framed for a murder she did not commit, she has everyone looking for her from the MI6 to MI5 the CIA and even her partner Luke is trying to find her where abouts but Sophie keeps moving around trying to find evidence that she was not the murderer. It was when Sophie first leaves the country that she meets Jack in the most unpredictable meetings! Jack has also been framed for a murder he didn’t commit and both he and Sophie pairup to try and find evidence to clear their names. When we first meet Sophie she was a disaster waiting to happen anything that could go wrong went wrong and I actually felt like her character was going to be a bit of a joke but as the story moves on her character began to grow on me and although there were times when I wanted to scream and shout at her when she has a number of close shaves in silly situations she puts herself in it soon became clear it was these situations which kept the book on edge. I didn’t find the book predictable I could not have predicted the ending to this book although I do wonder if you may have had a little bit more insight into who the murderer could have been if you had read the previous books. All in all this was a good read, a little different from my usual choice of books but I think it came along at the right time for me. I did enjoy this book but not enough to go back and read the previous books. As a standalone book it is worth picking up and it is currently an excellent price on kindle at the moment if you click the link below.